One of the great things about living in D.C. is the occasional political-figure-in-the-street sightings. Sure, I go to functions where big shots are speaking or attending. But those are never as fun as the surprise, "Hey, that was ..." in passing. As I idled on my bicycle after work the other day in front of my office (near Union Station and Capitol Hill), what comes racing around the corner but an orange Honda Element with Democratic political operative James Carville kicking back in the passenger seat (he may not have a position in Obama's administration, but he still gets driven around by other people) gabbing on a cell phone with his feet on his friend's dashboard. Carville helped Bill Clinton defeat George H.W. Bush in the 1992 presidential campaign. He is widely credited with inventing the term "[It's] the economy, stupid." He continued on as a Clinton loyalist by backing Hillary Clinton in the most recent campaign. And when former loyalist Bill Richardson, the governor of New Mexico, endorsed Barrack Obama, Carville called it "an act of betrayal. Mr. Richardson’s endorsement came right around the anniversary of the day when Judas sold out [Jesus] for 30 pieces of silver, so I think the timing is appropriate, if ironic." 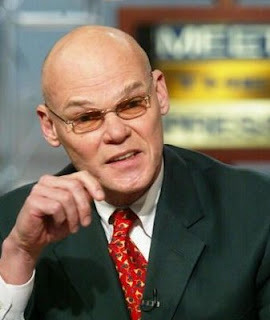 Carville went on to support Obama after he beat Clinton in the primary. He now teaches at Tulane University in New Orleans, but must be visiting D.C. during the August doldrums. This adds to my list of D.C. political street sightings, which includes Monica Lewinsky, John McCain, and John Kerry, among others.